According to Dr. Amesh Adalja, a senior scholar at Johns Hopkins Center for Health Security, the next global pandemic will most likely be of the respiratory variety and when it happens, it will almost definitely lead to massive breakdowns and disruptions to society as well as huge economic losses. Warning that even those who live in small towns will not be immune to a rapid outbreak of such a pandemic as all it takes is one traveler from out of the area to start the spread within any small town, this June 23rd story over at The Atlantic reports the next global pandemic is most likely just around the corner and "no amount of US retrenchment from globalization will halt that outbreak at the U.S. border". And while The Atlantic story also takes a shot at President Trump by reporting “there is a real reason for us to be scared of the idea of facing this threat with Donald Trump in the White House” according to Ron Klain, Barack Obama’s 'Ebola czar', information continues to emerge that 'the next pandemic' might be 'a planned event', as if a potential massive culling ahead was wrapping up the conclusion to some nightmare science fiction disaster movie. 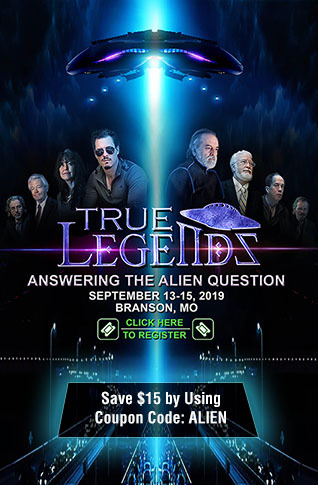 As we'd reported on ANP on July 16th, scientists had recently made huge advances in their search for deadly diseases that could wipe out humanity. That's right, they were searching for 'disease X', allegedly, in an attempt to come up with the 'cure' for it and had just found two new potential 'doomsday viruses'. 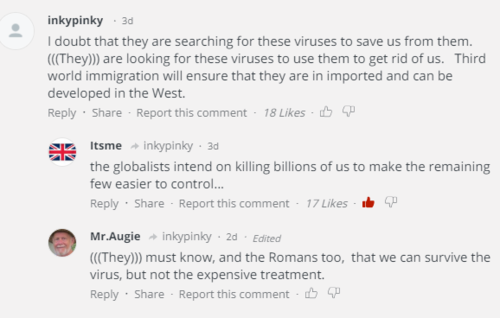 But what if the readers of the Express 'doomsday virus' story were right as we see in the excellent and very perceptive top-rated comments below, comments suggesting they were searching for such viruses to kill us all off? With the top rated comment also referencing 3rd world immigration being used to make sure that the spread of such deadly viruses into Western nations is accomplished, this July 6th story over at The Atlantic reports much the same: “Humanity is now in the midst of its fastest-ever period of change,” writes Ed Yong in the July/August issue of The Atlantic, "Urbanization and globalization mean pathogens can spread and become drug-resistant more quickly than ever." Piles of dead bodies. Decontamination zones and overstretched hospitals. It’s the stuff of nightmares: the physical indicators of a pandemic associated with outbreaks of diseases such as Ebola in countries such as the Congo. But what if one of those pandemics — yellow fever, perhaps, or an emerging pathogen scientists don’t even know about yet — landed in the United States? It’s not a matter of if, writes Ed Yong in a long-form feature for the Atlantic, online and on newsstands, it’s when. In “The Next Plague Is Coming. Is America Ready?”, Yong takes a clear-eyed view of the worst-case scenario: a public-health system caught off guard by a pandemic that spirals out of control. Yong builds a convincing case for a national lack of preparedness that, unless remedied on many fronts, could spell disaster when a new pandemic comes knocking. He worries about President Trump’s ability to take on an outbreak, especially given that he has left key positions unfilled. According to the developers for the strategy simulation game called Plague, Inc., an outbreak called 'Trump' is now the most popular killer virus name among game players as also seen in the image above. 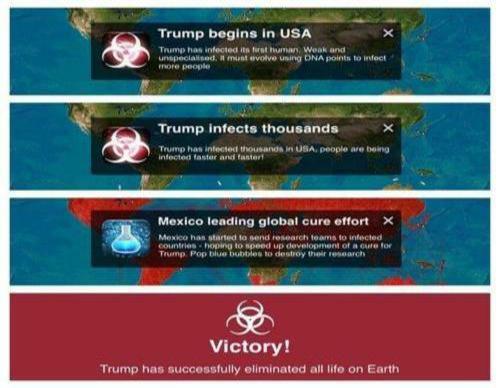 With the 'Trump virus' outbreak beginning in the USA according to the simulation before infecting thousands and spreading around the world, the particular simulation pictured shows 'Victory' achieved as 'Trump' successfully elimates all life upon the Earth. 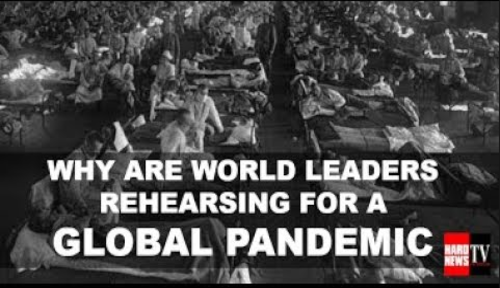 And with that game echoing the sentiments we see coming from many on the left who are going into full-scale meltdown mode over anything and everything 'Trump', why are the 'globalists' blaming President Trump for a pandemic that hasn't even happened yet? Back in February, the Washington Post put out this story titled "Trump could help curb a potential pandemic. Instead he has remained silent" within which they attempt to put the blame of a future pandemic in America upon President Trump despite the fact that such an outbreak has yet to happen. Well with Facebook joining Bayer/Monsanto and 'big pharma' in an all-out war upon natural, alternative health treatments while natural health practitioners are being 'knocked off' like flies, what do the globalists who are blaming President Trump for a pandemic that hasn't even happened yet know that we don't know? In this October 2017 story over at the Washington Post we learn that leaders all across the world have been preparing for a global pandemic with claims that "it will come sooner than we expect" despite those same people allegedly not even having a clue about exactly what they're preparing for. As the Organic Prepper reports in this new story, there seems to be a growing concern within the mainstream news media and establishment about potential biological attacks with their story asking, "do they know something that we don't know?" One thing I have learned after being involved in alternative journalism for all these years is that coincidences often lead toward some concrete event. Recently, some coincidences I have noticed have been related to biological attacks. It’s always rather subtle but there are definitely patterns that can sometimes lead up to large, horrifying events. Now, the good news is that this is not always the case. Sometimes, there are genuinely unrelated events that mean absolutely nothing. But, I still believe it’s important to pay attention, don’t you? Back on June 17th we published a story on ANP within which we published the maps above which detailed for us just how quickly a pandemic outbreak could spread all the way across America. Showing that nearly half of America and nearly every big city could be hit with an outbreak within the first 70 days (depending upon the particular disease and strain, of course), we asked then if a man made recipe for disaster could bring with it a tidal wave of death. Reporting then that researchers were creating their own mutations to deadly diseases in a lab that would allow a potentially catastrophic virus to spread more easily into human lungs so that they could better prepare for such an event, the story over at The Independent that we were reporting on also warned of the potential of "extreme danger posed by such infectious agents, which if unleashed could potentially cause a man-made global pandemic". Getting back to the previously mentioned story from The Express which reported scientists have now found two new viruses that could lead to a 'disease X' outbreak and potentially diseases that could wipe out humanity, WHY are scientists playing such deadly games which could turn into unmitigated global disasters? Certainly as we reported on ANP back on June 22nd, the brave new world of synthetic biology has opened up a 'pandora's box of trouble' with CRISPR gene editing technology now obtainable by practically anybody and as close as Amazon.com. In the first video below we hear about the US government creating a new smallpox vaccine with our videographer asking if a pandemic false flag may be ahead while in the 2nd video below, we hear one expert warning of the continually growing possibility of a potential global pandemic in our future. In the final video below, we see the new trailer of an upcoming pandemic horror movie, Patient Zero, and those paying attention know that Hollywood sometimes likes to tell us about things to come before they happen.